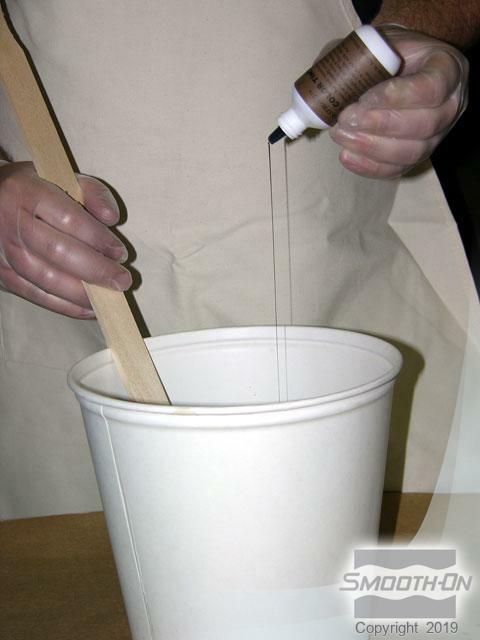 A woodgrain finish can be attained through the process of mixing Smooth-Cast® 320 with various colors of So-Strong® urethane tints and Ure-Fil® 5. Different wood finishes such as oak, pine, maple and mahogany can be achieved by varying the amount of So-Strong® tint and/or Ure-Fil® 5, then staining and clear-coating. 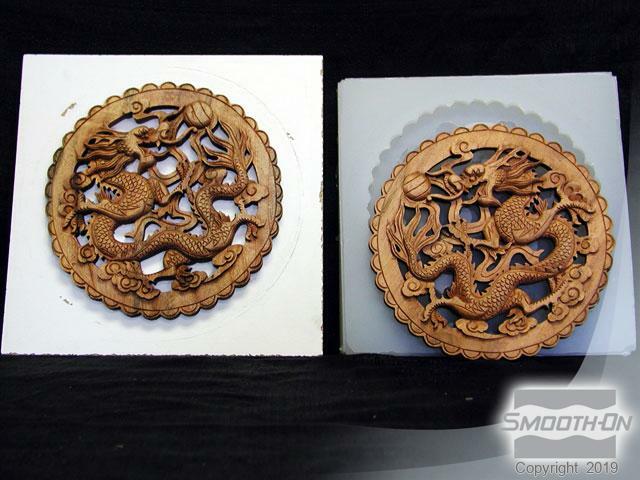 Casting wood pieces in urethane is fast, realistic and less expensive than hand carving. 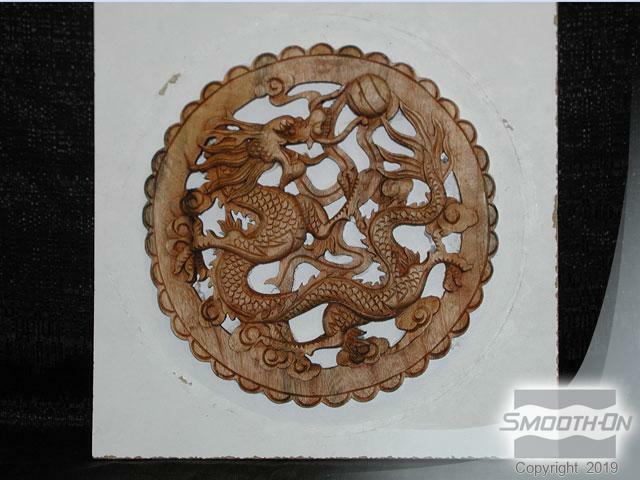 NOTE: In order to achieve a woodgrain finish or effect, the original model must have a wood grain pattern. 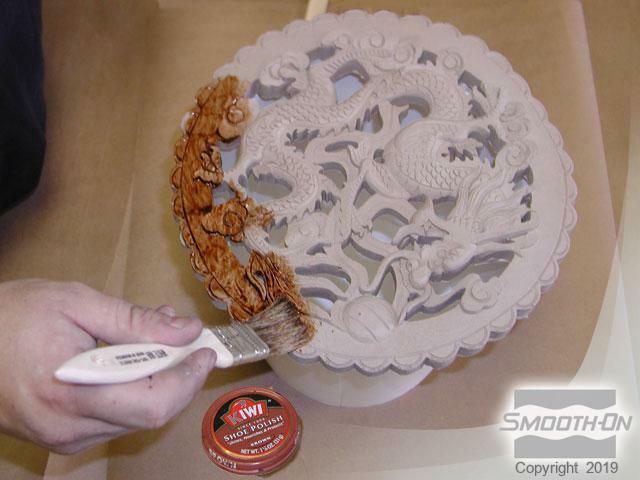 The original wood carving is sealed with SuperSeal® then glued to a base board. 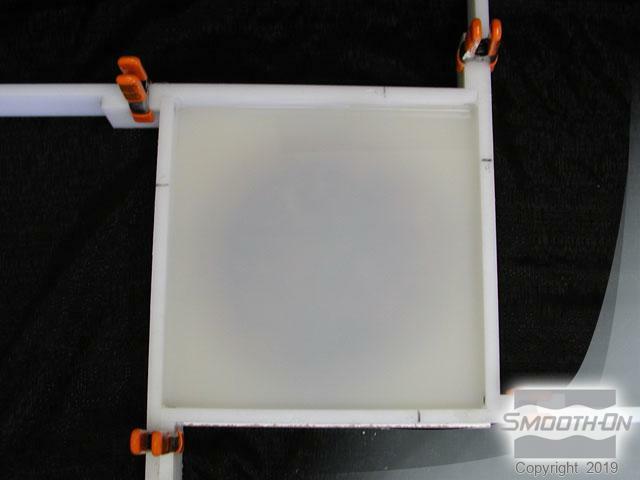 Walls are constructed around the object to form a mold box with a minimum of ½ inch clearance required. 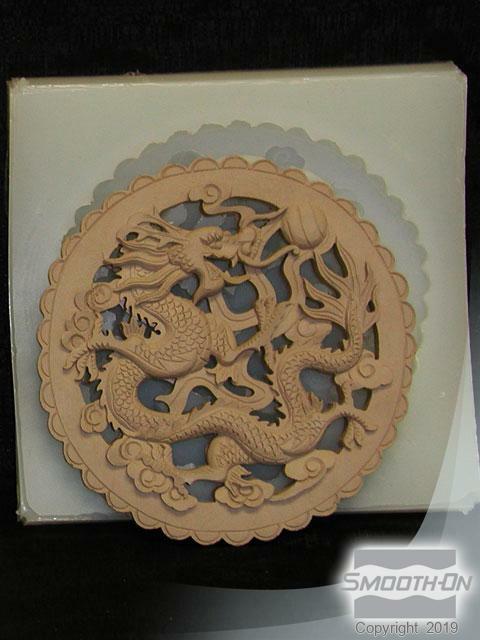 The Dragon Skin® silicone rubber is mixed, vacuumed and poured into the mold box completely covering the object with ½ inch of rubber and allowed to cure a minimum of 5 hours. 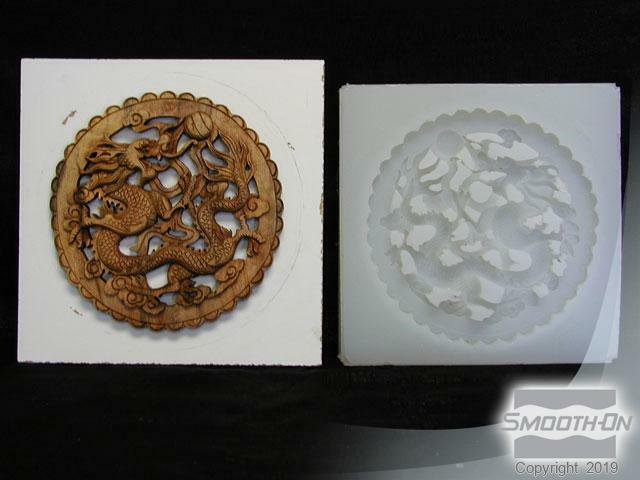 The mold walls and the Dragon Skin® mold are removed from the original carving. 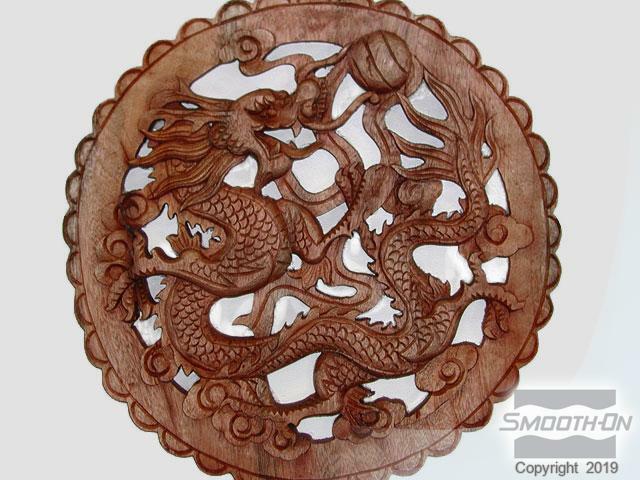 The Dragon Skin® silicone rubber captured the fine texture and detail of the woodgrain. 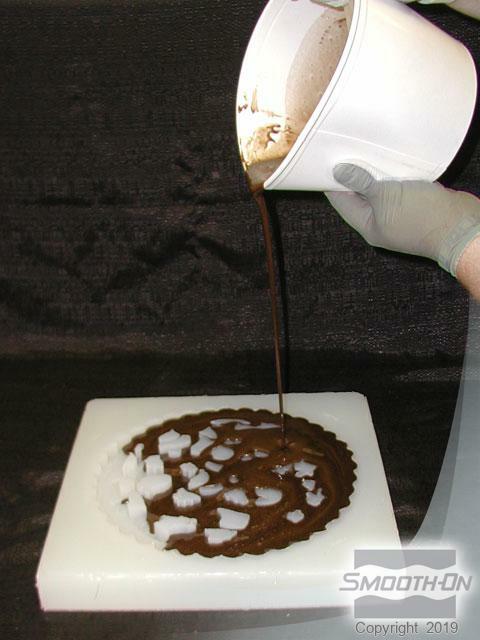 Smooth-Cast® 320 casting resin, Ure-Fil® 5, So-Strong® Brown tint and brown shoe polish are assembled along with mixing containers and supplies before beginning. 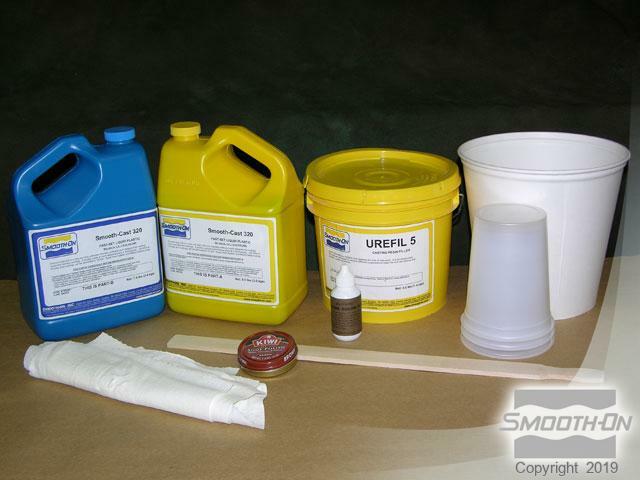 It is important that the Ure-Fil® 5 is 100% moisture free prior to use. 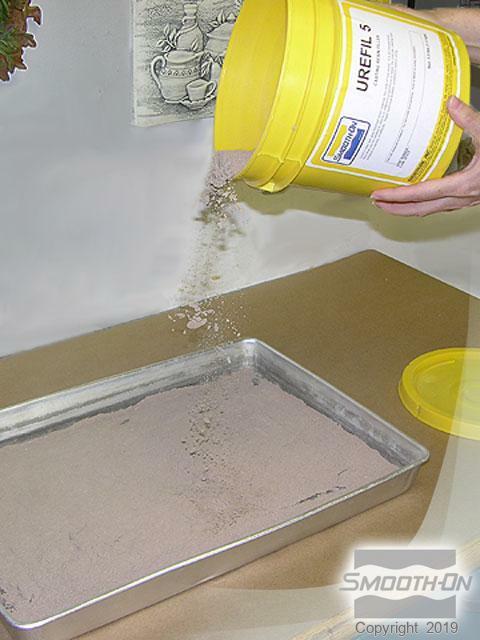 Recommended: Bake Ure-Fil® 5 at 150°F/ 60°C for at least 3 hours to eliminate any residual moisture. 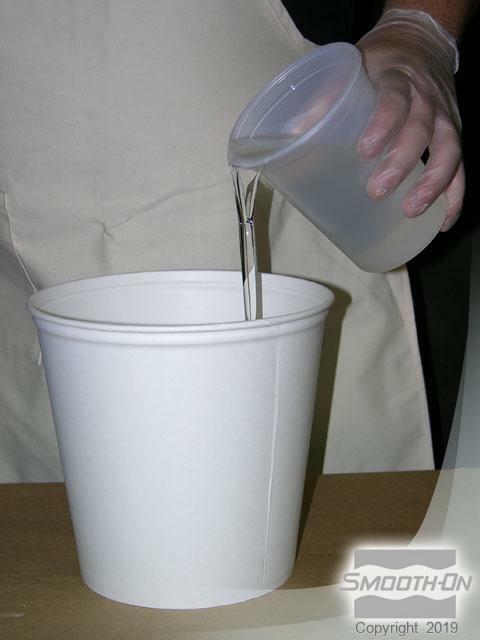 Allow the Ure-Fil® 5 to cool to room temperature before using. 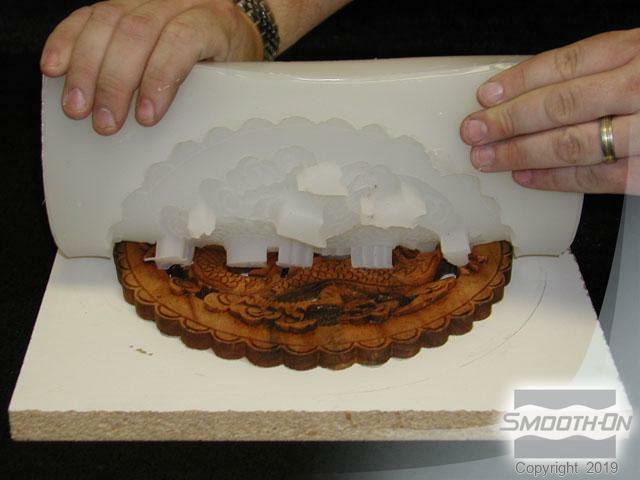 The Smooth-Cast® 320 Part A, Part B and Ure-Fil® 5 are measured in equal amounts by volume. 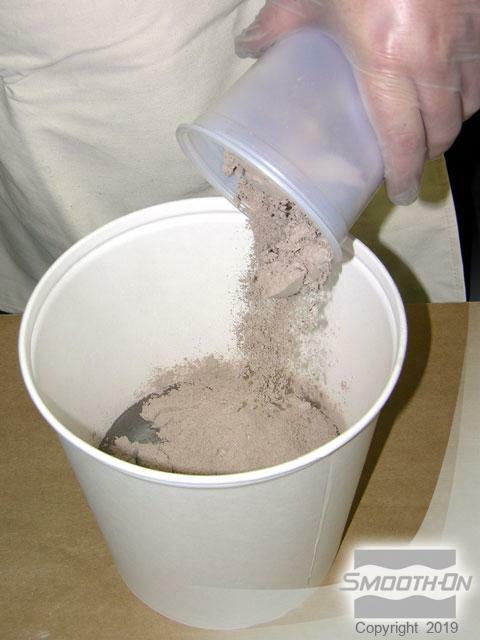 Smooth-Cast® 320 Part B is poured into a mixing container. The Ure-Fil® 5 is added to the Smooth-Cast® 320 Part B. Smooth-Cast® 320 Part B and Ure-Fil® 5 are thoroughly mixed. Once the Smooth-Cast® 320 Part B and Ure-Fil® 5 are thoroughly mixed to a smooth consistency, a few drops of So-Strong® Brown tint are added. 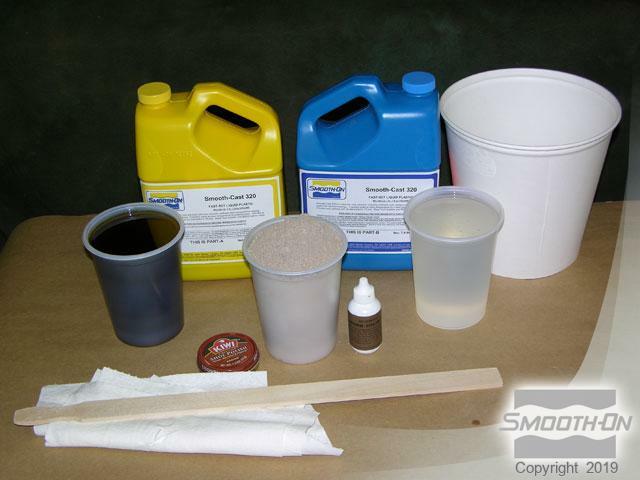 Smooth-Cast® 320 Part A is added and thoroughly mixed. 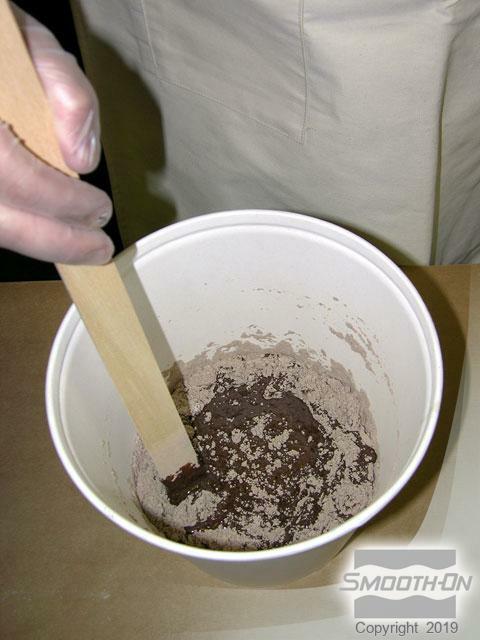 Scrape the sides and bottom of the container several times while mixing. 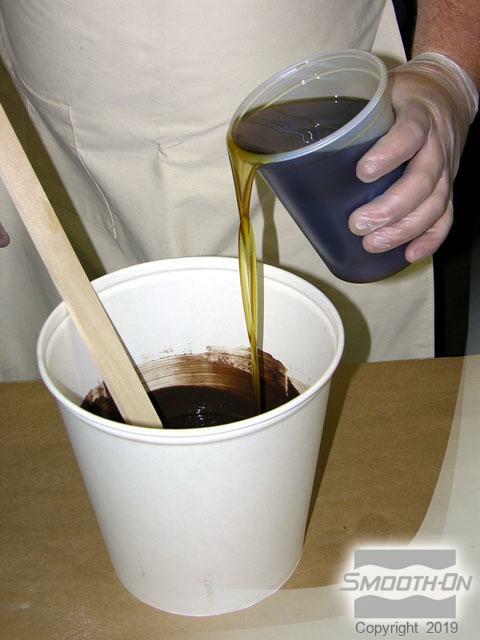 Once the liquid is mixed to a consistent color, slowly pour mixture into one spot of the mold. 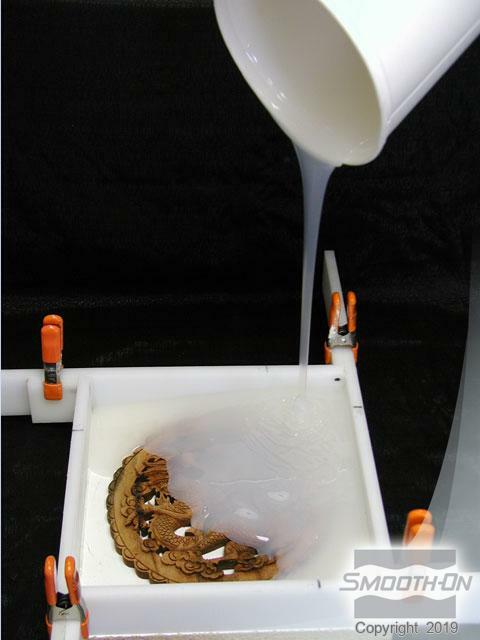 Allow the liquid to flow through the mold until the mold cavity is completely full. Allow the casting to cure for a minimum of 30 minutes. 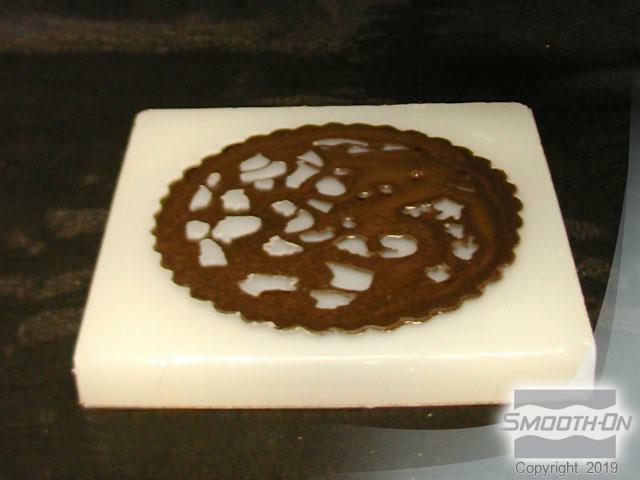 The cured casting is now ready to be removed from the Dragon Skin® silicone rubber mold. Brown shoe polish is brushed onto the surface of the casting to bring out the woodgrain but a variety of wood stains can also be used. When finished, the reproduction shows perfect woodgrain patern. 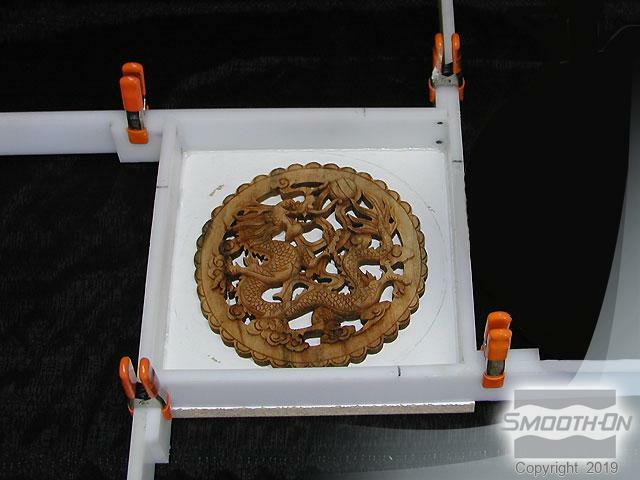 The finished casting leaves a perfect reproduction.